Through the years, Tomie has turned into a formidable series of movies, thanks to the inventiveness of the artist/writer Junji Ito, who drew so many Tomie manga that film-makers have had a mineful of ideas to draw on. I also talked about Ito's work in my review of Uzumaki, if you want to see more of the horror he's inspired. I think he writes and draws the scariest horror comics ever! 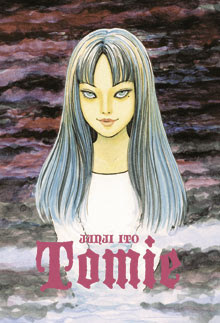 The original Tomie manga were thankfully translated into English in three volumes a few years ago, but you might still pick them up on eBay. The stories are graphically horrifying, but not graphic sexually. In simple black and white, Ito invokes body horror in a new and terrible way that the movies still find hard to outgross. So here we go with reviews for all seven Tomie DVDs. Each one has a stand-alone plot – so don't be afraid to dip in! 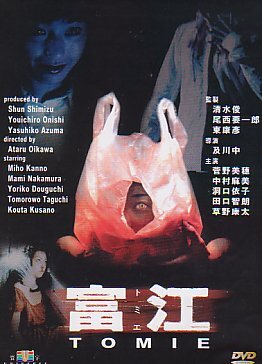 The first film, Tomie, was one of the earliest Japanese horror films I bought after seeing Ring. I wanted to find out what else Japan had to offer. First time around, I liked Tomie because of the queasy atmosphere and the obscure storyline - the idea of what was going on slowly dawned on me, and it was bizarre and horrible. 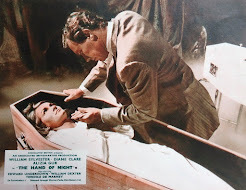 The iconic cover art of the eye looking out of the carrier bag was a brilliant hook - a throwback to the premise of Frank Henenlotter's Basket Case movies - something small, horrible and portable. Kept in a box in a dingy flat and fed by her demented boyfriend, Tomie slowly regains her full stature. Meanwhile upstairs, former classmate Tsukiko has no idea that the horror that blanked out her memory three years earlier, is actually her new neighbour. Tomie is a new monster – one we haven’t met before. This film is a good introduction to her and her methods. Tomie manages to capture the demented and violent world of the Tomie manga – the squabbling teenagers and their violent, tangled love lives. Tomie is so beautiful that she entrances her boyfriends. But like an addiction, they come to hate their dependence on her and the murder she incites. Actress Miho Kanno really looks like the manga Tomie, fleshing out the character with demented giggling, hairpin mood swings and an unearthly threatening stare. The film may not be as grisly as the manga, but it succeeds at hinting at further horrors. It sometimes does this with subliminal 'shock cuts' of visceral make-up effects, rather than the less physical computer-aided FX which I’m sure would be used in any US remake. Unfortunately, the carefully built-up tension, dissipates towards the climax. Tsukiko doesn't react horrified, so much as inconvenienced. The film ends with a damp squib and introduces some unnecessary loose ends at the last minute. It's not a perfect film, but achieves an awful lot on a low budget. Tomie is an original horror concept, and not a wannabe Ring. They were released the same year and I'm sure if Tomie had come out any later it would have been tailored to look more like Ring. 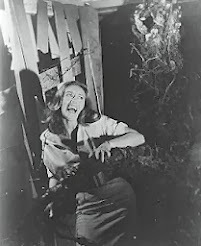 It's a film that I enjoy re-watching for the atmosphere of madness, and the scary soundtrack. Admittedly, I understand the plot better for having read the comics. I have the Hong Kong DVD (pictured above), that was released shortly after the film came out. It has poorly translated English subtitles, a washed out look, and a non-anamorphic widescreen transfer from a rather jumpy print. The dark areas are so crushed that Tomie's little trademark mole (under her left eye) is almost lost in the murk. But Tomie is now out on Region 1 DVD, as are all the other films. 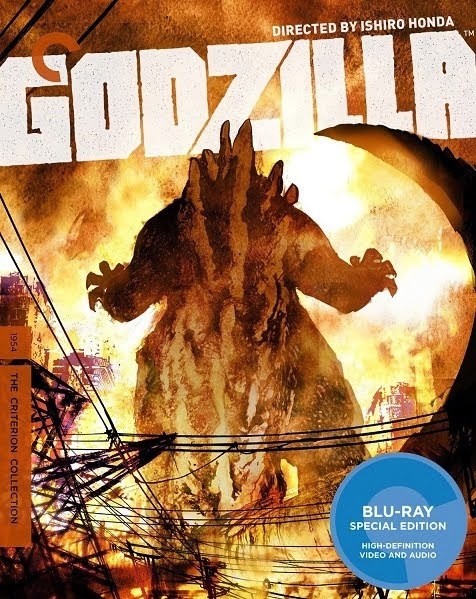 I hope it's a better transfer, with better subtitles.